I want / don’t want the heart on my card. If you say “Yes,” you will be automatically added to the Donate Life Texas registry and your card will be printed with a Hero’s Heart symbol as a great reminder of your choice to save lives. It’s great to say “Yes” even if you are already registered – there is no need to worry about duplicate records, our system takes care of all that. If you say “No,” the heart symbol will not appear on your card. If you have already registered and say “No,” don’t worry, you won’t be un-registered. It just means you won’t have the heart symbol on your license this time. If you have a license without a Hero’s Heart and want one, or if you have a heart on your card and don’t want one, you can request a re-issued card at the DPS office. Please be aware that there is a charge for a re-issued card. 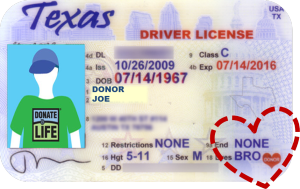 If you believe there has been a printing error, please contact Info@DonateLifeTexas.org to initiate an inquiry. Note: A Hero’s Heart symbol is not confirmation of active donor status. A person’s most recent action is what takes precedence. What that means is that if a person’s withdrawal from the online registry is more recent than the date on their license, the heart icon no longer provides donation consent. The law is written this way to give individuals total control over their donor status, even if a heart appears on their license. Get more details on how to remove your name from the registry. Fun Fact: Thanks to the support of the Texas Department of Public Safety, more than 6.8 million people have joined the Donate Life Texas registry when applying for or renewing a Texas driver’s license or ID card.